At the Hounslow Council Cabinet meeting on Tuesday evening (19 March), a new plan was approved for improving the borough’s street-scene. The paper sets out a new strategy takes into account the Mayor of London’s Environment Strategy and the DEFRA Resources and Waste Strategy. The plan outlined has been shaped through working closely with the borough’s residents, to understand their needs, customs and habits to develop a strategy that improves service delivery, gets people on board and establishes new ‘norms’ that can be rolled out effectively across the borough. The paper outlines the challenges that need to be addressed in a borough with a rapidly growing population and a high proportion of rented housing, against the backdrop of social change that involves people eating on the go in a 24-7 economy. Hounslow has a proactive, passionate and enthusiastic community that is very committed to the borough but feel disappointed to see what they perceive as a loss of community civic pride and a deterioration in standards of acceptability in terms of cleanliness, while enthused by the level of local activism and willingness to improve things. The borough’s Residents Survey supports this sentiment and lists the top area for the council to concentrate on in this coming year as street cleaning. Reducing fly tips and taking care of the environment are also cited as key priorities. The council additionally commissioned an independent review of the borough’s street scene and street cleaning service, supported by members and the community who shared their views and helped identify key issues. A Cleaner Borough programme is being devised that will tackle waste, while improving recycling and the street environment across the borough. The programme will draw together a range of activities in one campaign, with deeper understanding of issues, through interactions with the public, informing any reshaping of services. 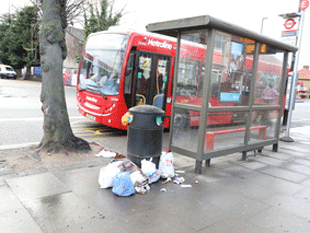 £425,000 has been requested from the Environment Fund to support the Cleaner Borough Programme, split over 2 years. “We all love clean streets and want to live in a borough where people take pride and work together to achieve a cleaner, greener borough. “This new strategy aims to improve the boroughs street scene, increase recycling rates and change people’s behaviour for the better, through working directly with the community.